This gorgeous floral design crock is the modern version of the original French "beurriere". 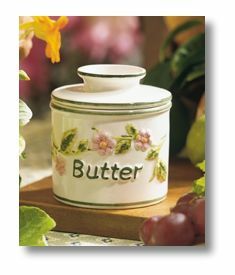 The Butter Bell crock allows butter to be stored at room temperature, on the counter or tabletop, for up to 30 days without spoilage, refrigeration or odors. A favorite kitchen accoutrement of chefs around the world,the Butter Bell crock is easy-to-use and dishwasher safe.